“We categorically deny any imminent departure of Phoebe Philo from Céline,” an anonymous spokesman for LVMH said. This is a tried and tested statement; the house practiced using it in February 2016 when it was falsely reported the British designer had left the French house. On Tuesday the rumour mill churned again, signalling the latest possible departure of a creative director from a luxury conglomerate. Was the Spring 2018 outing her last? Was it any good? 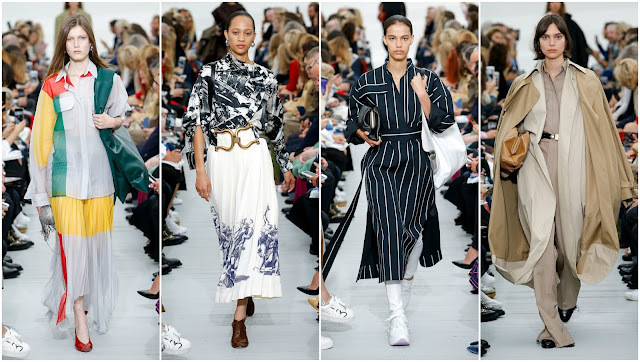 It's worth analysing for a number of reasons—firstly, it's Céline, one of the most sought after luxury brands with an intuitive response to women's needs and how they want to dress; secondly, Phoebe Philo likes to keep her audience guessing, what will it look like this season? She's moved away from the more rigorous shapes that dominated her collections in the early 2010s, favouring a more gestural, fluid approach to clothing. Thirdly, if it is one of the most sought after brands, is it any good? There's an intellectual veneer surrounding brands like Prada and Céline. If you don't get it, you feel like that is because you haven't fully understood the deeper meaning—something needlessly applied to many things nowadays—and not simply because it could be slapdash or, to put it bluntly, dull. Philo doesn't work in the same way as other designers when it comes to inspirations. Generally, she opts to channel feelings into her garments which is where the intellectual veneer derives from, the clothes become a vessel for emotion. If there's a misfire, and there are some in this show, many would rather rest on their laurels than investigating whether the clothes were just subpar. The mood Philo was aiming for here was joy! Optimism! Freedom! Those were prevalent motifs during the Spring 2018 shows as designers wanted to move away from the political turmoil and towards the personal world, filling it with hope and positivity, rather than cementing it in its stupor. She was thinking about he 1980s, a loose background to the show, when fashion hadn't yet been transformed by globalisation and it was a famously fun fairground for industry personnel. She resurrected the wide-shoulder for the Céline woman, oversized polo-shorts and a sophisticated take on Working Girl with the occasional candy-coloured explosion. The strongest pieces were the ivory drop-waist dress with intricate laser cut lacing, a boxy off-white leather coat and a burgundy-hued dress with a photographic collage print that hit the narrow runway in the show's denouement. Most interestingly, this show was presented directly after Demna Gvaslia's third womenswear outing at Balenciaga. It was rather disconcerting to see the same silhouettes and glamorous insouciance permeate these clothes as they did only two hours prior. There were some distinctly Céline looks such as the beautiful, sumptuous tailoring which remains as effortless as always. The way the fabric drapes on the body is also identifiable as a Céline signature. However, the needless layering of garments, the ugly-chic trainers, the odd take on bad taste for the luxury consumer who doesn't associate with such influences rang true to be Balenciaga-isms... or, at least, they felt like ones given the show's proximity to it. On the day, it felt like the garments could've bled into the previous show, where checks and pinstripes and cheap-looking wallpaper prints also appeared. It was an unfortunate scheduling conflict, highlighted when viewing the collection online, months later, removed from the context of fashion week, and it looking fresher than before. If anything, it shows despite stylistic similarities the clothes here transcend the time they are presented in. Industry sources have said former Stella McCartney design director and current Ports1961 creative director, Natasa Cagalji is a possible front runner to replace Philo. There is also Céline's head of ready-to-wear, Michael Rider and their former design director Ilaria Icardi are also names being mentioned, according to the Business of Fashion. Philo's direction of the brand has seen it grow exponentially, with an increase in annual revenue of €500 million over 10 years. The brand, which has been slow to adapt to the digital age, is expected to boost its online profile with an e-commerce outlet down the line. It's times like this when one has to ask, will passing the torch make much of a difference? Anthony Vaccarello's aesthetic isn't much different to his predecessor, Hedi Slimane's at Saint Laurent. Mimicking what Phoebe Philo has going will be an uphill battle, perhaps even for insiders. Her Céline tenure has been marked by an understanding of the female psyche, her clothes are imbued with emotionality: it'll be hard to replicate.